It has become the custom of some car manufacturers to find ways to give back to the communities in which their factories are located. For some it takes the form of disaster relief or local clean up efforts, for others scholarships, or school supply giveaways. For several years, volunteers from Nissan’s Canton Assembly Plant have worked not only to build cars, but to build houses. They’ve done that working with a well known charity, Habitat for Humanity Mississippi Capital Area, an organization involved in building or renovating homes for more than 600 families in Hinds, Madison, and Rankin counties. This year the team members from Nissan built their 11th house. Almost 100 team members participated in the two-month project, as reported on the Nissan website. Nissan’s Canton plant is in line with similar community outreach from the company as a whole. Nissan North America has logged nearly 100,000 volunteer hours and contributed more than $15 million in 13 different communities through Habitat. 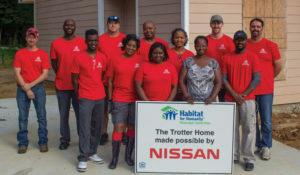 The company connection to Habitat began after Hurricanes Katrina and Rita, when Nissan donated 50 trucks and sent employees to help rebuild homes. Since 1986, HFHMCA has built over 630 houses in partnership with low-income families in need, according to the organization’s website. The local Habitat branch has covered Hinds, Rankin and Madison counties for the past 30 years, where it has also “developed infrastructure for and rebuilt 2 previously abandoned subdivisions, demolished over 170 condemned houses, rehabilitated/weatherized over 155 more homes,” for needy families.